Woodend, a rural township on the north side of the Mount Macedon range, is 65 km north-west of Melbourne. It is on the old Calder Highway and the railway line to Bendigo. By the late 1830s most of the land in the Woodend district had been taken up for pastoral runs. The road to the north-west of Melbourne was punctuated with inns or stopping places, and in 1841 the Glen Dhu Inn was opened near where the road crossed the Five Mile Creek, north of the Macedon Range. The Five Mile Creek settlement became the site of Woodend. When gold was discovered at Bendigo in 1851 the north-west road was the main goldfields route, and Five Mile Creek was the place where travellers rested after passing through the Black Forest. A site for a town ‘Woodend at Five Mile Creek’ was gazetted in 1851, and ‘Woodend’ presumably denoted the end of the wooded or forested landscape. A school was opened in 1855, the forerunner of the present State primary school, along with Presbyterian (1859), Free Presbyterian (1860) and Catholic (1861) schools. An Anglican church was opened in 1859 and a Wesleyan chapel in 1860. A court of petty sessions was established in 1862. Woodend’s place on the colonial map was confirmed in 1861 when the railway line from Melbourne reached the township and the Woodend, Newham and Rochford Road District was created. On 3 February 1862, the Woodend (borough) municipality was proclaimed. 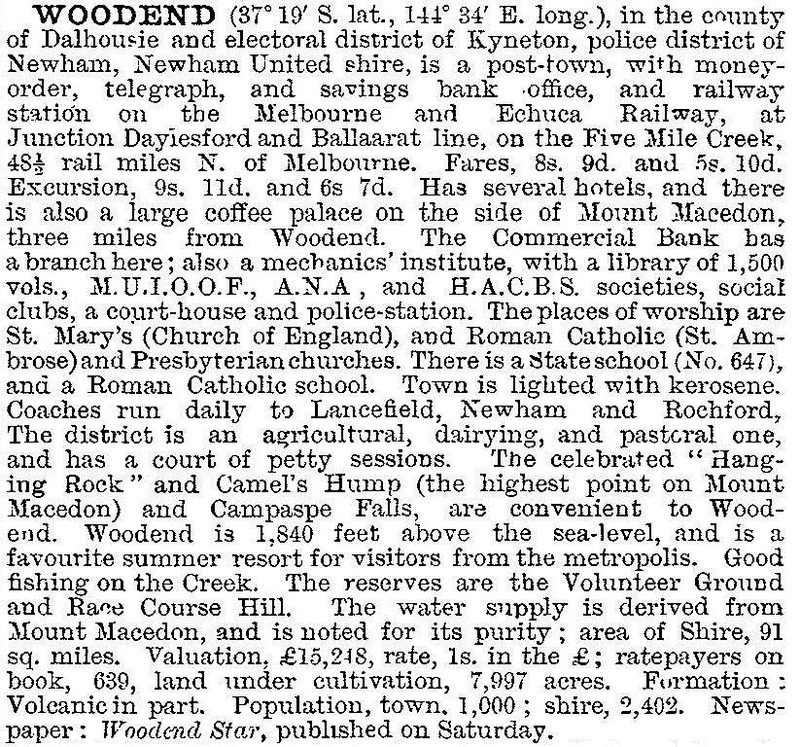 By then Woodend also had a racing club (1860) and a mechanics’ institute (1862). On 17 November 1871, the borough was incorporated with the United Shire of Newham. Hanging Rock (Mount Diogenes) is a volcanic mamelon, made of external viscous rock which weathers unevenly, 8 km north-east of Woodend. When privately owned in 1869 it was promoted as a resort, with a hotel and sports meetings, and on New Years’ Day 1880 the first race meeting was held east of the Rock. In 1884 the colonial government acquired the Rock and surrounding area for recreational purposes. The Macedon region became a destination for excursionists and holiday-makers in the 1880s and in 1890 Braemar House was built 4 km east of Woodend. It was a fashionable guest-house until acquired in 1918 for Clyde Grammar School. 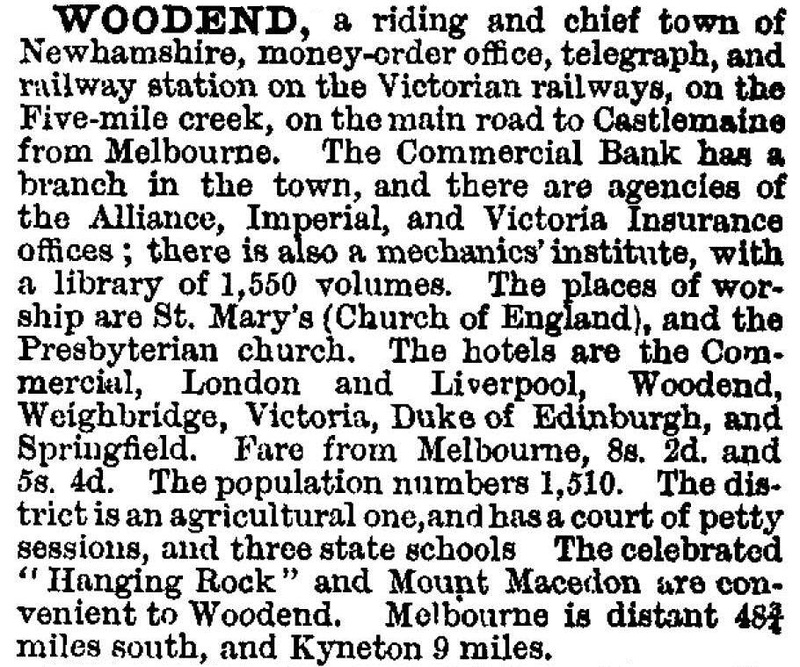 In 1871 Woodend’s population was 1452. For the next 100 years its population remained two or three hundred below that figure. The major industries included tourism and two private schools. In 1967 Joan Lindsay’s novel Picnic at Hanging Rock was published, and in 1975 it was made into a film which was a landmark in a resurgent Australian film industry. The novel concerns the mysterious disappearance of three schools girls at Hanging Rock. The division between fact and fiction was left for audiences to discern: Lindsay had attended Clyde Grammar School (before it moved to Woodend), and the Rock had been a favourite picnic destination for Clyde Grammar girls, giving the story an aura of fact. Co-incidentally the release of the film came when Woodend began to undergo urban growth, as the township was within reach of metropolitan Melbourne after the opening of the Tullamarine Freeway in 1970. In 1978 the Hanging Rock reserve was given improved facilities, and the New Years’ Day’s picnic races became a popular drawcard. Clyde Grammar School ceased in 1975 and the property was merged with Geelong Grammar. The property was acquired for the Braemar College Christian Secondary School soon afterwards, jointly supported by the Anglican, Catholic and Uniting churches and the local shire council. Woodend avoided the worst of the Ash Wednesday bushfires in 1983, although Braemar’s grounds were affected. Woodend has three churches, State (394 pupils, 2014) and Catholic primary schools, a range of sports facilities, a swimming pool, a golf course and a heritage centre in the former court house. The former shire office is a service centre of the Macedon Ranges Shire council, and tourist services are found in an information centre on old Calder Highway near Five Mile Creek. Just beyond there, the highway crosses the creek on a heritage-registered bridge (1862). The racecourse has been superseded by the Hanging Rock site. An avenue of honour for fallen servicepersonnel extends for several kilometres along the old Calder Highway north of Woodend. There is an annual winter arts festival which began in 2004, and the Betinck Private Hotel maintains a traditional hospitality. A plan for a housing development at Davies Hill was rejected in 2011 as being out of character with Woodend, but a revised smaller version was resubmitted for approval in 2014. Following intervention by the State government the Macedon Ranges shire abandoned controversial plans in 2014 for a tourism and accommodation development at Hanging Rock.